Starring: Sam J. Jones, Melody Anderson, Max von Sydow, Topol, Ornella Muti, Timothy Dalton, Brian Blessed, Peter Wyngarde, Mariangela Melato. 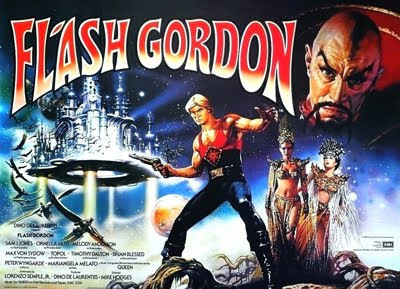 This version of Flash Gordon, while being faithful to it’s comic book roots and being primarily a science fiction film, has many connections with James Bond. Let’s look at the cast. Max Von Sydow, who plays the bald villain of the piece, Ming The Merciless, turned up four years later playing Ernst Stavro Blofeld in Sean Connery’s Never Say Never Again. Next we have Topol, whose very next film role was a Milos Columbo in For Your Eyes Only. And that brings us to the big one – yes, Timothy Dalton, who would inherit the throne of James Bond from Roger Moore and appear in two Bond films, The Living Daylights, and Licence To Kill. While this 1980 version of Flash Gordon is hardly the inspiration for the spy films that were to follow throughout the 1980’s, it is interesting to see that old stereotypes die hard. It is almost as if the characters that the actors inhabited in this film, had a celluloid memory. The movie opens with Ming The Merciless (Max Von Sydow), and evil space tyrant who rules the universe, proclaiming that he is bored. The chief of Ming’s armies, General Klytus (Peter Wyngarde) draws Ming’s attention to a small planet called Earth. Ming, using an advance weapon of some kind, amuses himself be visiting upon the Earth a battery of storm and other ‘un-natural’ disasters. Back on Earth, waiting for a flight is Flash Gordon (Sam J. Jones). Gordon is a professional American football player for the New York Jets. Also waiting for a flight is Dale Arden (Melodie Anderson), who is a travel agent. As they wait, the Earth is bombarded with ‘hot hail’, which are actually chunks of moon rock raining down on the planet. Once the plane is ready, Gordon and Arden board and then take off. With all the unexplained weather patterns tearing up the world, I guess it was pretty stupid for Flash and Arden to get into a plane, and in the end they pay for their folly. A giant chunk of moon rock hits the cockpit and the pilots mysteriously vanish. As the plane spirals out of control, Flash rushes to the cockpit and tries to land the plane. He has been taking flying lessons, so he knows a little bit about aircraft. Unfortunately his lessons hadn’t gotten as far as landing, and Flash crashes down, the plane sliding on it’s belly for hundreds on metres and finally coming to rest in the laboratory of Dr. Hans Zarkov (Topol). Zarkov is a mad scientist, and was kicked out of NASA for his outlandish theories. One of his outlandish ideas was that people from another galaxy would attack earth. In response, Zarkov has made his own rocket with which he intends to travel to the aggressor’s planet and negotiate a truce. Well now it seems like Zarkov’s crackpot theory has become a reality and he wishes to travel to the aggressor’s planet. The only problem is that he needs a second person to help pilot his rocket. When Flash and Dale crash in his laboratory, it appears that he has a volunteer. At gunpoint, he orders Dale into the capsule because she is lighter. Flash, naturally doesn’t want to see Dale kidnapped by a mad scientist, so he rushes into the capsule and wrestles with Zarkov. In their struggle, Gordon knocks the launch button and the rocket begins to lift off. It seems that all three of them will make the journey to the aggressor’s planet. The aggressor’s planet happens to be Mongo, and when Flash, Dale and Zarkov arrive they are not treated warmly. They are taken prisoner and marched before Ming The Merciless. Their arrival coincides with a tribute ceremony, where delegations from the planets under Ming’s rule have come to pay tribute to the evil tyrant. Among the delegations, there are representatives of the Hawkmen, ruled by Prince Vultan (Brian Blessed); and the Treemen of Aboria, ruled by Prince Barin (Timothy Dalton). Zarkov’s mission of peace immediately fails. Ming The Merciless is not interested in saving the Earth. His only interest is in Dale Arden who he wants to add to his own personal harem. This doesn’t sit too well with Flash who has quickly formed an attachment to her. Gordon openly defies Ming and begins to fight with Ming’s guards. Flash, despite being heavily outnumbered puts up a good show, using his American football skills to good use. But eventually, he is captured and Ming orders that he be executed for his defiance. Flash Gordon is a fantastic film. Sure, the special effects aren’t on a par with some of the other science fiction extravaganza’s that where being made at the time, but this film owes more to it’s comic books origins rather than some kind of futuristic reality. In keeping, the colour levels in this film are pumped up to the maximum, falling a fraction short of day-glo. From the outrageous costumes to the grand sets, everything is lavish and lurid. The dialogue is so stylised you can almost see the ‘speech bubbles’ when the character’s speak. Another positive is the soundtrack by rock group Queen. Although these days, it may be considered pretty uncool, I rate Queen’s soundtrack to Flash Gordon very highly. I bought the vinyl record when the film was first released, and now have even updated to CD – and I play it more often than any normal man should. I know – it’s a sickness! Apart from the heart thumping title song – hey, we all know that one – the rest of the score is quite brilliant – from the rough and tumble rock of the football fight – to delicate lilting moments when Flash and Princess Aura (Ornella Muti) fly over the planet of Fridgia. This soundtrack contains it all. It even has a guitar driven version of the bridal march – you know, ‘Here comes the bride…’ – I once met a guy who actually used this at his wedding. It’s a shame that Queen never really did anymore movie scores because this is very good – Highlander doesn’t really count, as Queen just wrote songs that complimented the themes in the movie – I am talking about an actual musical score, which follows the plot and generally doesn’t have lyrics. For me, at least, Flash Gordon is one of the greatest movies of all time – or more correctly – one of the most entertaining movies of all time. Yep, it’s camp, it’s cheesy and it looks incredibly fake, but that is its charm. This is not art – if you want that go to a museum. This is pure and simple, comic book story telling, and in that sense this film works on nearly every level. loved the movie, loved the soundtrack, loved queen. I remember Blue Peter, TV show in the UK made a big deal of this movie as one of their hosts was in it. This film was like the darker version of The Shadow but set in space. Over the top, but great fun to watch. I'm sure I saw an episode of star trek voyager where they did a sort of homage to flash and all the over the top B science fiction movies.